Size: overall size 53.5 x 62.5 cm, image size 47.5 x 55 cm. 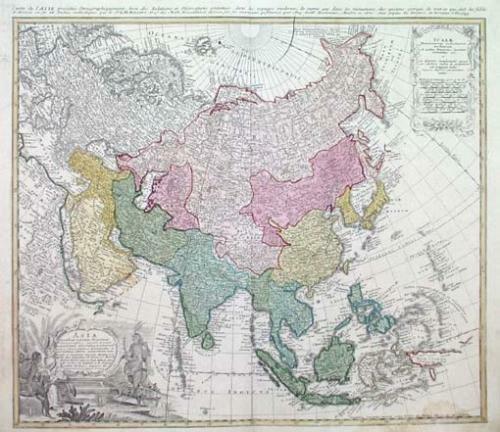 An attactive and very detailed map of Asia from Arabia to the Pacific Ocean, including Japan and Southeast Asia. "Nova Gvinea" is shown with incomplete borders. Published by J.M.Haas & Gottlieb Boehm. A large folio map, on good paper with folds as issued. The map has an original border and wash coloring with some staining in the upper margin, two wormholes in the left and right margins that are covered with archival tape on the back. Generally the map is in very good condition.